What it’s about: The best-known fraternities may be of the college variety, but long before beloved Greek traditions of pledging, playing pranks on crusty deans, and being hospitalized with alcohol poisoning, there were fraternal organizations for adult men (and occasionally women). Some were set up for mutual financial and emotional support, and some were just bunches of guys who liked to drink together while wearing silly hats. We can all agree that both are equally worthwhile endeavors. Strangest fact: Perhaps “odd” is a better word than “strange.” One of the oldest and largest fraternal organizations in the world is the Odd Fellows, an organization so old no one’s quite sure how old it is. The Encyclopaedia Brittanica claims there’s no evidence the organization extends past the early 18th century, but claims have been made that the group started in the Middle Ages or even Roman times. The name comes not from any unusual behavior, but from the fact that, when the fraternity was presumably founded, many tradesmen had organizations built around their profession. Men who belonged to smaller, “odd trades,” founded the organization for any “odd fellows” who didn’t belong to an existing group. The organization has fractured many times, most notably during the Jacobite risings, so there are several loosely related Odd Fellows groups active today. 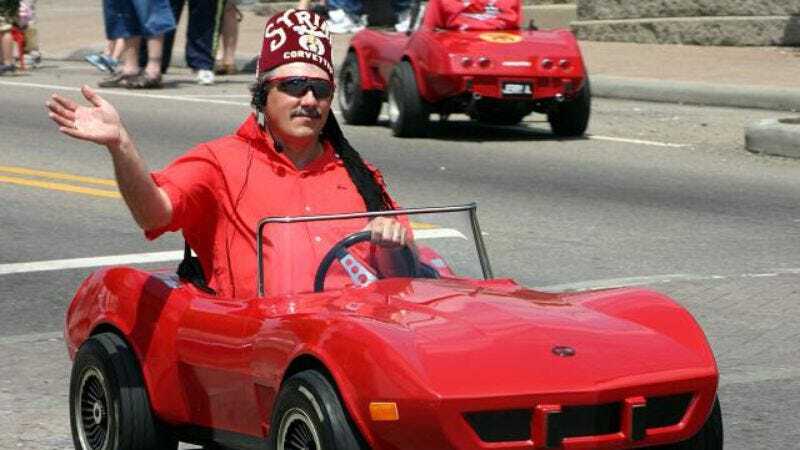 One American-based group, the Independent Order Of Odd Fellows, boasts a membership of 600,000 across 26 countries. The various Odd Fellows organizations have millions of members worldwide. Like most fraternal organizations, they seem to split their time between charitable works and drinking. Biggest controversy: As the word “fraternal” would suggest, most of these organizations admit men only. Most began as mutual support clubs for tradesmen at a time when women were expected not to have a trade, and many organizations haven’t changed with the times, although some have gone coed. Thing we were happiest to learn: There’s a Concatenated Order Of Hoo-Hoo. In January 1892, six men in Gurdon, Arkansas, decided to form a fraternal organization for men involved with the lumber industry (although the six founders worked in tangential fields like railroads and newspapers that covered lumber issues). The first suggestion for a name was the reasonable-sounding “Independent Order Of Camp Followers,” but somehow that was beaten out by “Concatenated Order Of Hoo-Hoo,” “hoo-hoo” being 19th-century slang for a lumberjack. Thirty-five of “the leading lumbermen of the country” were accepted into the group at their first meeting, and by the end of the decade, the Hoo-Hoo had 5,000 members. The organization exists today, and while it has provided charitable support to members who have fallen on hard times, it seems to mostly be for fun, as evidenced by their ongoing commitment to silly names: the Order’s ruling council has nine members with titles like Scrivenoter, Arcanoper, and Custocatian. The reasons behind the addition of “Antediluvian” in the 1850s are murky, but the word refers to something predating the biblical flood, so it’s obviously a misnomer. While “order” is often used by fraternities, in Britain the word refers to orders of knighthood, which the Buffs are not. And, of course, there are no actual buffaloes in Great Britain. However, the Royal Order has done much good work through the years, setting up orphanages years before the state began to do the same, and forming the first ambulance service in England during the First World War. Also noteworthy: While many fraternal organizations are either secular or nominally Christian, there are some overtly religious groups. B’nai B’rith (Hebrew for “Children Of The Covenant”) is a Jewish service organization, committed to fighting anti-Semitism, as well as supporting the faith and doing charity work focused on Jewish communities. The Knights Of Columbus is the world’s largest Catholic fraternity, promoting Catholic education and defending the faith, alongside the usual charitable works. Best link to elsewhere on Wikipedia: Even entertainers have their own fraternity. Founded by British music hall performers in 1889, the Grand Order Of Water Rats was formed “to assist members of the theatrical professions… who, due to illness or old age, are in need.” The Order typically organizes performances to raise funds for a particular cause. Membership is limited to only 200 members, men only, and past and present members include Charlie Chaplin, Peter Lorre, Peter Sellers, Jon Pertwee, Laurel and Hardy, Maurice Chevalier, Bob Hope, George Martin, and Engelbert Humperdinck. And Prince Charles is considered an honorary member for supporting the Order’s charitable efforts. Further down the Wormhole: E Clampus Vitus is a fraternal organization devoted to the heritage of the American West, although it self-identifies as a “historical drinking society.” Among its quirks are honorary memberships handed out to presumably unaware figures including Ulysses S. Grant, J.P. Morgan, Julius Caesar, Henry VIII, George Washington, and Andrew Jackson. (There’s a chance Grant may have been an actual member.) The Clampers also extended membership to Joshua A. Norton, a 19th-century figure who declared himself Emperor Of The United States and “Protector Of Mexico.” We’ll explore his reign next week.